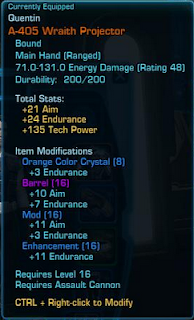 One of my favorite features in Star Wars: The Old Republic is item modifications and custom items. If you want to read in depth about the system, check out this developer post. I'll give you a very short version. Custom items are shells, which you can add mods too all the way through the end game. That means if you like the look of an item, you can keep it indefinitely. Custom items (labeled orange) can also be used by your companions. So you are able to customize their look as well. 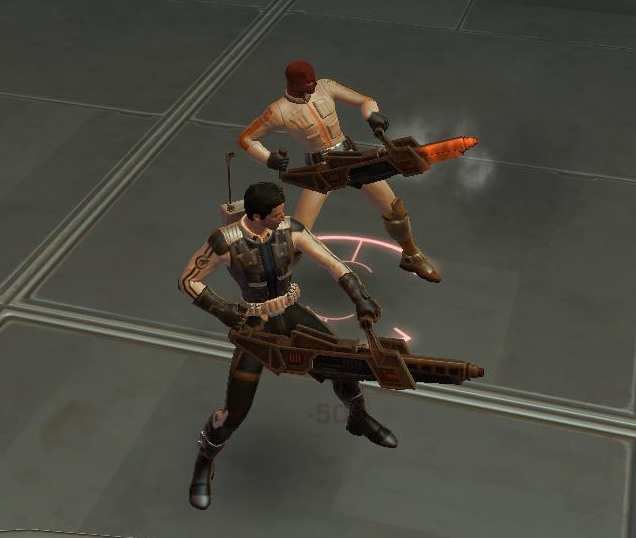 This weekend, I did just that and purchased matching A-405 Wraith Projector Assault Cannons for myself and my companion, Aric Jorgen. 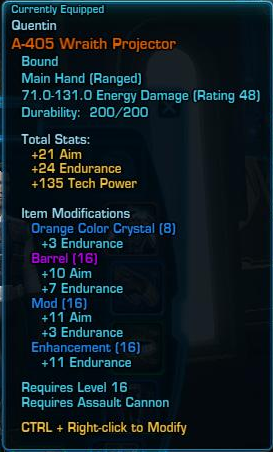 I took Armstech as a crew skill, so I was able to upgrade the Barrel on both weapons. The A-405 cost 14 Coruscant Commendations a piece, but I had plenty. It looks decent, but I'm sure I'll find something better down the line. Here is me and Aric with our new toys. I love being able to customize equipment for myself and my team. In fact, I've started to collect Custom gear for companions I may get in the future. I have a Lightsaber and Blaster from the Esseles Flashpoint, along with some Plasteel pants.